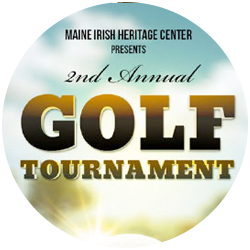 Book your wedding at the Maine Irish Heritage Center! Now booking for 2019 & 2020 weddings and receptions. 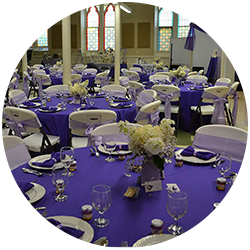 In 1997, Saint Dominic’s, the third oldest Catholic Church (serving Catholics since the 1820s) in the state and the home to the largest Irish Catholic parish north of Boston was closed by the Catholic Diocese. The beacon to all and community gathering place was purchased by the City of Portland and gifted to the Irish American Club and Friends of St. Dominic’s. Thus was born the Maine Irish Heritage Center, whose purpose is to protect, preserve and restore the historic landmark that was formerly St. Dominic’s Church, to provide a meeting place for Maine’s diverse communities, and to promote Irish culture, history and heritage by telling the story of the Irish and Maine. 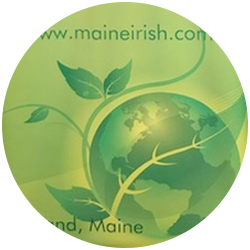 In January of 2003, the City of Portland presented the keys to the building known as the Irish Cathedral to the Maine Irish Heritage Center. 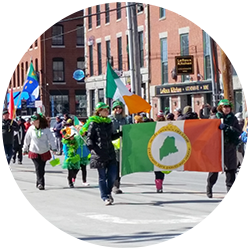 With one in six Mainers of Irish descent, its importance as a place of living history is much valued and now holds a place of honor in the state as the Center for all things Irish in Maine. The Maine Irish Heritage Center was closed for the most part from May 2006 until the fall of 2008. The 4,100-pound bell fell from its moorings in the tower and then a Patriot’s Day storm wrought severe damage and havoc on both the exterior and interior. The building reopened amidst much fanfare in October 2008, with Eamon O’Cuiv, grandson of the famous president of Ireland, Eamon De Valera, presiding. The Maine Gaeltacht Irish DNA Project is housed through the Family Tree DNA website. The project uses the Family Finder autosomal DNA test. Download the genealogy form to get started.